Josiah Taft, 4, plays at the water table in his public preschool classroom at P.S. 3 in Brooklyn. 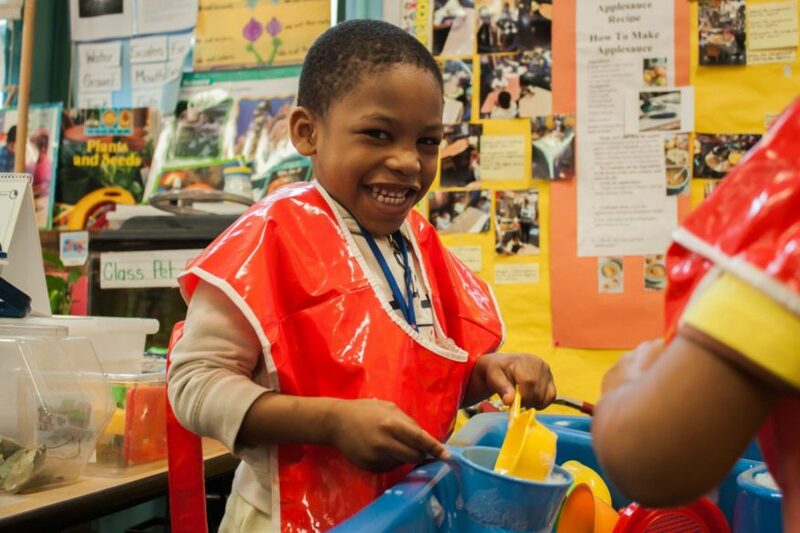 New York is one of a handful of big American cities that offer universal preschool. And yet, though most countries with developed economies offer public preschool as a standard benefit to all of their 4-year-olds, America does not. Instead, low-income parents here scramble for scarce public spots while middle-income parents scrounge to pay for increasingly costly private preschool. Brandon and his co-authors peg the cost of sending a child to a preschool that has ample, safe facilities, a developmentally appropriate curriculum and well-paid teachers, at about $13,655 per child per year for full-time, full-year preschool. That’s about $1,000 more than the national average per pupil spending in K-12, as calculated by the National Center for Education Statistics. Iowa supports two pre-K programs with state funding: Shared Visions for children ages 3 to 5 and the Statewide Voluntary Preschool Program (SWVPP), designed to increase 4-year-old children’s access to pre-K opportunities. In Iowa, 26,310 children were enrolled in pre-K programs in the 2016-17 school year, National Institute for Early Education Research data show. Shared Visions uses competitive grants to public schools, licensed non-profit child care centers, other public non-profit agencies and Head Start. The state or local funds paid $7,404 per student in Shared Visions in the 2016-17 school year, Hechinger Report research of the National Institute for Early Education Research data showed. The federal government spent $8,291 per student in Head Start. The vast majority of government funding for early childhood is meant to help children living in poverty overcome the stubborn and troubling academic achievement gap that separates them from their wealthier peers. Despite this focus, there’s not enough public money budgeted to provide preschool to all the children who qualify for aid, let alone to help children from higher income families. Take the Hechinger Report’s short survey to tell about your experience and ask questions Hechinger Report may be able to answer in future reporting projects. Meanwhile, new evidence suggests that the most cost-effective state preschool programs for poor children are those that include all children. Universal state preschool programs have a significant positive effect on the reading scores of children from low-income homes, while programs targeted only to poor children do not, found Dartmouth College economist Elizabeth Cascio when she analyzed kindergarten performance data for children from states with different policies governing who is eligible for free preschool. While existing economic segregation means that a universal preschool wouldn’t serve a perfect mix of lower- and upper-income families, it would be more mixed than the current system, which clusters children living in poverty. And there’s evidence that middle class families like the idea of free public preschool. In states where universal preschool is offered, Cascio found, middle-income parents take advantage of it. In contrast, attendance at government-funded preschools is the norm in many countries. Four-year-olds are enrolled in school at an average of rate of 87 percent among the world’s 35 developed economies tracked by the Organization for Economic Cooperation and Development, an international cooperative meant to help member countries grow their economies. The U.S. is a founding member, but just 66 percent of 4-year-olds were enrolled in school here in 2015. Most of the other OECD countries also spend more per preschooler than is spent in the U.S. The economic incentive for middle-class American parents to send their child to a free public preschool is clear. While most parents don’t spend the $13,655 a year Brandon and his colleagues estimate would buy the best-quality preschool experience, middle-income parents are spending hefty percentages of their paychecks on preschool — between 9 and 12 percent for families earning between $50,000 and $100,000 a year — according to calculations by Grover “Russ” Whitehurst, a senior fellow at the nonpartisan Brookings Institute. In 2016, Whitehurst found, parents spent an average of $7,053 on preschool fees for their 4-year-old children. He points out that government subsidies at the low-end and the tendency of those in the middle to save money by choosing part-time preschool affect the averages. Parents’ willingness to spend so much on preschool, even for part-time slots, could be seen as evidence that they don’t need government subsidies to send their kids to preschool, Whitehurst writes in his recent report on the market price of early education. Related: Should Wall Street pay for preschool? Whether or not you think the middle class needs help to afford preschool depends on your perspective. American children from families earning between two and three times the federal poverty level, about $51,000 to $76,000 for a family of four, enroll their children in early childhood education programs located at stand-alone or school-based centers at about the same rate as families earning one to two times the poverty level, about $25,000 to $51,000 for a family of four, according to the National Academies of Sciences report. (Ranges are based on the 2011 poverty levels used in the report and have been adjusted for inflation.) In other words, lower-middle-class families use preschool at the same rate as low-income families, despite using more child care overall. Families earning three to four times the federal poverty level, or $76,000 to $102,000 for a family of four, also use less-than-expected amounts of center-based care. It’s not until family incomes reach the top of the middle-income range that more than half of families choose center-based care, which is likely an indication that they are finally making enough to consider the cost of center-based care affordable. Most of the benefits formal preschool programs provide can be attributed to well-trained, well-educated preschool teachers. Research shows that schools with high-quality teachers produce the best academic and social outcomes for children. The best teachers encourage play, exploration and friendship, while simultaneously introducing pre-academic skills through picture books, science experiments, math games and other activities. Yet, for all that work, most private preschool teachers are making near-poverty wages. The average wage for preschool teachers who are not employed by a public school system is $13.98 an hour or $29,080 a year, according to the Bureau of Labor Statistics. 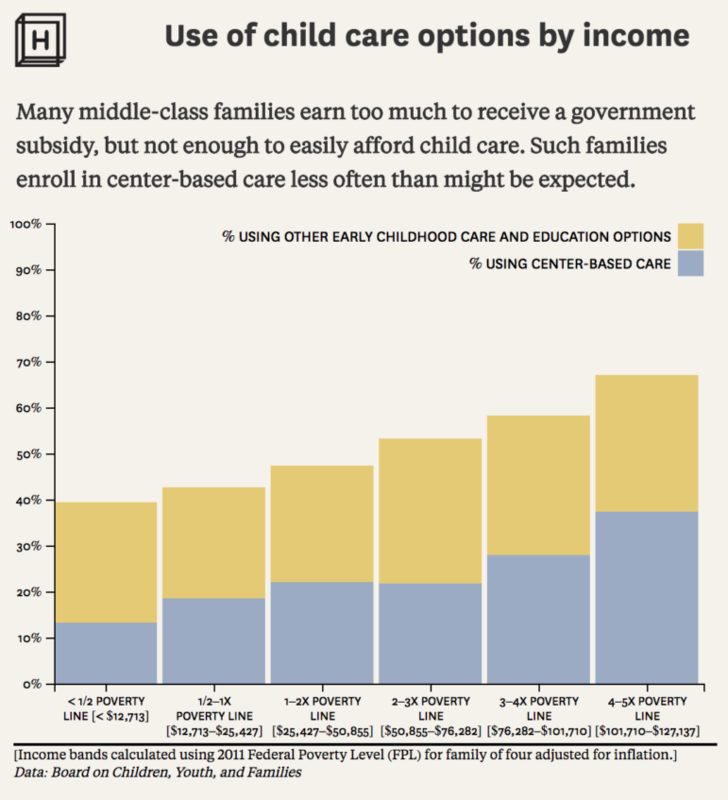 “To the extent that (child care) is at all affordable to middle class families, it’s on the backs of providers who are then living in poverty,” said Katie Hamm, vice president of early childhood policy at the progressive Center for American Progress. For child care workers overall, including those who care for preschool-age children in home-based child care facilities, the situation is even more dire. Nearly half, 46 percent, make so little as to qualify for some public assistance, like Medicaid or food stamps, according to the early childhood workforce index published by the Center for the Study of Child Care Employment. Among preschool and kindergarten teachers, 34 percent qualify for some form of public assistance. The only preschool teachers who make what could be considered a middle-class wage are those employed by public schools. Public school preschool teachers make an average hourly wage of $24.06 or $50,040 a year. But only five states, and a handful of cities, offer free public preschool programs that accept children from families with middle-class incomes. Related: What do preschool teachers need to do a better job? Without new government funding to offset the cost, higher teacher wages would push preschool out of reach for even more families. According to a calculator released by Center for American Progress, paying preschool teachers on par with K-12 teachers, a move many experts say would raise preschool quality, would push the annual per student cost in many states up over Brandon’s $13,655 per year estimate. For $13,655 per year to fit the government’s definition of affordable, a family with one child would have to earn $195,071 annually, an income well above middle class. Despite these efforts, just 1.37 million children attended public preschool during the 2017-18 school year, about a third of the number who attended public kindergarten, according to the National Center for Education Statistics. A scattering of other efforts are aimed at helping middle class families afford preschool without increasing public programming. A bill currently under consideration in Colorado would defray child care costs for families earning up to $150,000 a year by offering them a tax write-off. The bill’s proponents argue that such assistance would help continue the state’s current economic boom by keeping relatively high-earning parents in the workforce. Keeping parents in the workforce and offering more kids a chance at a high-quality preschool education would have a “two-generation impact,” Freemire argues. Despite the popularity of both early education and increased help for the middle class, neither Republicans nor Democrats at the national level are arguing that the U.S. should match its international counterparts and provide the same standard of education for its 4-year-olds that it currently provides its 5- to 18-year-olds. It would be an expensive gambit. The National Academies of Sciences report estimates the total cost would run to $140 billion a year. Evidence suggests such an investment would pay dividends running to the trillions of dollars in money saved on social services and raised through income taxes on higher incomes, but the political will to make it happen is lacking. The chance to have a voice in who the next U.S. president is and fighting for what is right, watching a new generation make a difference and even watching as states change to either red or blue are some of the many reasons young first-time voters are ready to take part in the 2016 presidential election.